Central India offers an insight into the country's historical riches such as the rock-strewn Vijayanagara ruins of Hampi. Starting from bustling Mumbai, we journey through the Deccan Plateau's highlights before relaxing on the white sandy beaches of Goa. most vibrant cities in India as well as the richest city in India, with this in mind it is a very exciting place to start our journey. For our first introduction of Mumbai we will have a late afternoon orientation of the Colaba area on foot. The Colaba is the gateway of Mumbai so we will start by visiting the honey-coloured Gateway of India arch. This arch was built to commemorate the visit of King George V and Queen Mary in 1911 but it was not completed until 1924. As this arch was built for a British King it was appropriately the place where the last British troops left India. Today we spend a full day sightseeing with our local guide. A highlight of the day will be our visit to the area where the film 'Slumdog Millionaire' was set, a thriving and industrious quarter called Dharavi. We also visit the Mahatma Gandhi Museum where we learn a little about the great man's life and ideas, through an impressive collection of books, photographs and letters. On Malabor Hill we drive past the Towers of Silence. Built by the Parsis fleeing persecution in Persia during the 17th century, the Towers were a mortuary for the dead. Being traditionally Zoroastrians they were deposited in these towers to allow nature to dispose of them. We also visit the municipal dhobi ghats and the Prince of Wales Museum, which has an excellent collection of Indian miniatures from the Mughal and Rajasthan schools. This morning will be left free for you to explore Mumbai on your own. After lunch we transfer to the station to catch a train to Aurangabad (approx 7hrs). lovingly illuminate the Buddhist stories in flowing colours: real, live, sensuous characterisations, without the rigid hieratic postures one normally expects - an art form sanctioned by a transcendental philosophy, where lovers drink wine together and handsome kings and beautiful princesses sit serenely on their thrones attended by adoring handmaidens. This morning we visit the impressive Daulatabad fort - towering 250m above the surrounding countryside on a volcanic lava rock. Its three main walls have ingenious defences against elephant charges consisting of multiple, spike-studded doorways. Nearby are the World Heritage listed Buddhist group of caves, the Temples of Ellora. Dating from the 6th-8th century AD, they contain elaborate sculptures of intricate detail. These caves are not naturally formed, but have been painstakingly hewn out of the hillside over a period of five centuries. They consist of over thirty monastic chambers and shrines and are a triple record of the aspirations of Buddhism, Jainism and Brahmanism. As Indian Buddhism entered its fatal decline, Hinduism reasserted itself once more and Siva is sculpted in his eternal dance of life and death. Here stands the amazing rock-cut masterpiece, the Kailasa, a replica of the mountain abode of Siva, probably the world's biggest monolithic structure: it measures 33m deep by 81m long and 47m wide, and the stonemasons removed some three million cubic metres of rock to create it. In spite of its massive proportions, the temple is carved all over in the most intricate detail as if it were an ivory miniature - except for the inner sanctum, the holy of holies, where Siva appears quite simply as a lingam or phallus, the symbol of regeneration. On our route back to Aurangabad we stop at Bibi-ka Maqbara (an imitation of the Taj Mahal built as a mausoleum for Aurangzeb's wife). Once we arrive back in Aurangabad we transfer to the train station where we board our overnight train for our overnight ride to Hyderabad. We arrive in Hyderabad and transfer to the hotel before our guided tour. Founded in 1589, the city went on to father some of the richest men in India, due in no small part to the diamond mines around nearby Golconda. In the late morning we plan to explore the lively bazaars and colourful Islamic monuments of this bustling capital. Most of the city's historical sites are found in the Old City, close to the bazaars, and are best explored on foot. We visit the Birla Temple and the Charminar, or 'Four Towers', built to celebrate the end of a plague in 1591. This magnificent cream square archway stands on four 56 metre towers near to the colossal black granite Mecca Masjid Mosque, the sixth largest mosque in India, made of huge slabs and accommodating up to 10,000 worshippers. In the afternoon we drive to visit the extensive ruins of the Golconda Fort, its citadel towering 120m above the 16th century battlements. Intriguing elements to the fort are the excellent acoustics, hot and cold water system, natural air conditioning and Turkish Baths. Built by the Qutb Shahi dynasty, the fort was once considered impregnable and even its massive gates were equipped with elephant proof spikes! Battles fought here were significant in the struggle between the Moghuls and Qutb Shahi kings, who once dominated the area. We also visit the nearby Qutb Shahi tombs. There are 10 tombs in the area, all made of black granite or greenstone and housed beneath an onion dome. The most impressive is that of King Muhammad Quli Qutb Shah, the founder of Hyderabad who ruled until 1612. We start our day by driving to the town of Bidar, the roads are poor in this region and it will take us around 4 to 5 hours to complete the journey. On arrival we will will vist Bidar's fort with its ruined palaces and tombs of the Bahamani kings. Large parts of the fort are now in ruins but the walls remain in good condition which gives us a good idea on how vast the fort would have been. We'll walk through the formal gardens and view the large mosque which unfortunately is no longer in use. We'll also make a short stop at cannon point to see one of the larger bastions used to protect the city against invaders. 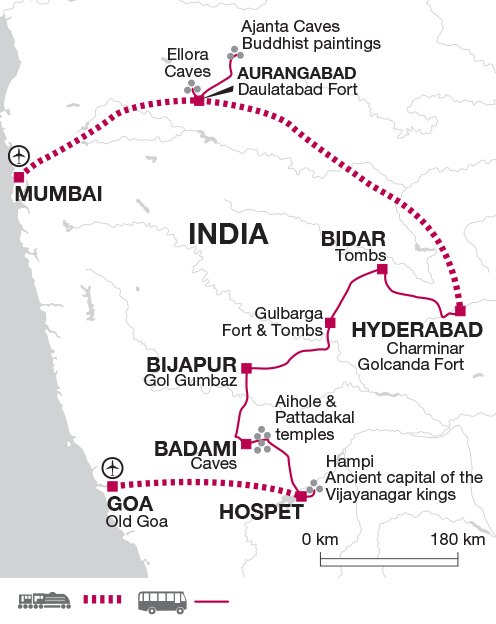 This morning we leave Bidar and drive to Gulbarga, the founding capital of the Bahmani dynasty. We take an orientation tour of the city, taking in the major sights, including the Bala Hissar Citadel, the elegant domed Jami Masjid and the Tomb of Bahmani Sultans. We depart Gulbarga and continue our journey on to Bijapur. Before leaving Bijapur today we visit the Gol Gumbaz, the vast mausoleum of its 17th century ruler Mohammed Adil Shah. The mausoleum's unsupported dome is second in size only to St Peter's in Rome, an astounding 38 metres in diameter. It is not cast in the florid architectural style of the East, but is more Turkish in character - severely bare and restrained, with a remarkable whispering gallery. We'll test out the dome by standing on opposite sides and whispering in to the walls, the effect is incredible. We also visit the Jami Masjid Mosque, acclaimed by many as one of the finest in India, remarkable for the harmony and grace of its slender minarets and stroll through the colourful and bustling daily market in the middle of Bijapur. We depart from Bijapur and drive to Badami. We wake up in Badami this morning. Once the capital of the Chalukyan, but now a small village with a busy bazaar nestling between sandstone hills. We will take a short drive to the famous Cave Temples of Badami. Now a World Heritage Site, the temples were hewn out of solid rock as early as 550AD and their interiors are lavishly adorned with reliefs and statues, one even containing an 18-armed Shiva. Later on this morning we drive to Pattadakal, situated on the banks of the Malaprabha River. Another World Heritage Site, its pink-tinged sandstone temples date back to the 7th century and represent a mixture of South and North Indian temple styles, confirming its importance as a meeting point of both traditions. After a guided tour here, we then stop at the temples of Aihole. The sheer number of Aihole's 70 temples vividly brings to life the glories of the post-Gupta period and reveals the genesis of Hindu medieval art (c.600). It is easy to imagine what this place would have been like in those heady days of creative construction; here is Hindu temple architecture in its most embryonic form. Stopping to visit a number of the temples, we then continue to our destination for today, the town of Hospet, our base from which we explore the astonishing archaeological site of Hampi. Hampi was once the flourishing capital of the Vijayanagar Kings (14th to 16th centuries), who ruled one of the largest Hindu empires in Indian history. Suddenly destroyed in 1565 after the battle of Talikota, the ancient ruins are almost ethereal, a place of departed spirits. We aim to visit the temples of Virupaksha and Vittala, with its remarkable carvings, and amid the desolate and fantastic boulder-heaped landscape we come upon the Queen's Bath and the richly carved King's Throne, the finely sculptured pillars of the Ramachandra Swami Shrine, the vaulted Elephant Stables, the two-storied Lotus Pavilion and the huge granite image of Narasimha, one of Vishnu's incarnations. The city was reputedly the size of Rome at its peak, with a population of half a million people and with numerous temples and monuments in the South Indian Dravidian style of architecture, the site is one of the most remarkable in all India. We will have a full day there with a local guide and return to our hotel in Hospet at the end of the day. Leaving Hospet behind, we take the early Amaravati Express train to Madgaon, arriving at the palm-fringed shores of Goa in the late afternoon, the one time Portuguese colony on the Arabian Sea. Under Alfonso de Albuquerque, the Portuguese landed here in the 16th century, captured the original Arab trade settlement and began building a city with houses, gardens and fountains, monasteries, chapels and churches (most of them gone), including the white, 17th century cathedral of St Catherine, which still stands. Goa eventually became the entrepôt for East and West, where merchants could buy pearls, coral, rubies, golden jewellery, silks, China porcelain, lacquered furniture, ambergris and exotic spices. The Portuguese influence is still very much apparent - the main religion is still Roman Catholic and siestas are still widely practised in the hot afternoons. Like most areas in India, Goa has its own food specialities, you may also want to sample the locally brewed spirit feni - a spine-tingling drink made from coconut or cashews. This morning we will visit Old Goa where your tour leader will take you on an orientation tour. The afternoon is then free for you to discover Goa yourself. We are based in Panaji, Goa's easy going capital; a friendly, sleepy town of narrow winding streets and whitewashed shuttered houses. Close by the capital are the superb beaches of Gaspar Dias and Dona Paula. The Malabar beaches here are very long and very white against the turquoise waters of the Arabian Sea, but be careful, as bathing in some areas can be marred by a strong undertow. Pack mainly for \ Hot Conditions\ . Select your clothing carefully, bearing in mind that temperatures are hot most of the year. You should bring a light jumper/fleece for cooler evenings. You may also consider bringing a small umbrella or waterproof between October and December when the chance of rain is greater. We recommend loose fitting shirts, trousers and underwear (nothing tight or made of nylon). Local people may be offended by revealing western styles of dress. Brief shorts tight fitting clothing etc. should be avoided by both men and women. Laundry facilities are available at most hotels. Comfortable walking shoes and sandals/trainers. Torch, insect repellent, sun hat, sunglasses, sun cream and a water bottle. Although entirely voluntary, tipping is a recognised part of life in this region of the world. Some local staff will look to members of the group for personal recognition of particular services provided. Accordingly you should allow approx. £35 for gratuities for local staff. On this trip we are travelling to several areas that aren't on the main tourist map and accommodation options are limited. Bidar, Bijapur and Badami in particular are very simple hotels and service can be slower than normal. Accommodation in India is as varied as the country itself. Standards do not equate to standards in the UK and it's best to approach each type of accommodation with an open mind, especially on trips that go in to less-visited areas where the choice of accommodation can be very limited. Service can be slow in places especially when travelling with a group. For the most part hotels do not have heating so in the winter months it can be chilly and if you feel the cold you may wish to ask for extra blankets. Hot water is not always available 24 hours a day in some of the smaller properties, and with a group staying you might find if you are showering last you may miss out on the hottest water. Food in this region is always fresh and tasty and one may days you will find it much cheaper than at the more touristy parts of India such as Delhi, Agra and Jaipur. Whilst in Bidar, Bijapur and Badami you are less likely to find meat options and alcohol is also harder to find. You will however have lots of tasty, fresh vegetarian dishes and delicious dals. Food isn't hugely spicy but there is a good mix of spicy and mild available in most places.